A heritage amusement park is being suggested as a potential future plan for the Dreamland funfair site in Margate, Kent. The Save Dreamland Campaign said it was proposing the idea as part of current public consultation over the site. 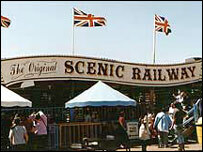 Based around the listed Scenic Railway ride, it would incorporate old theme park attractions from across the UK. Two proposed schemes being exhibited by Margate Town Centre Regeneration (MTCR) also include a similar heritage idea. The company is displaying models and architectural drawings until 7 May, as part of its redevelopment proposals for the site. MTCR is working with Thanet District Council on a range of theme park, retail and residential options for Dreamland. But the Save Dreamland Campaign hopes its suggestions can be taken into consideration. Spokesman Nick Laister said: "The Heritage Amusement Park would include some of the remaining examples of Britain's amusement park heritage. "The listed cinema building would also be brought back into use with rides, shows, bars, restaurants and an amusement park/seaside heritage museum. "We are already in talks with several amusement parks around the UK, that are closing or have closed, about taking a small selection of the rides that best represent Britain's amusement park heritage." One of MTCR's official options would also see the Scenic Railway restored with a heritage amusement park developed around it. A planning application could be submitted to Thanet District Council by August.